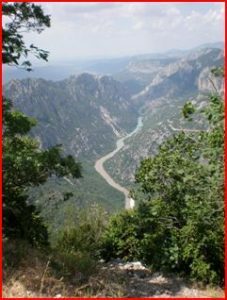 If you’re not afraid of heights, consider a trip to the Gorges du Verdon, the world’s second largest gorge that forms a border between the Var region of Provence and Alpes de Haute Provence. While it’s not a short trip by car from the Cote, the spectacular view is well worth the effort. The 25 km long drive takes about an hour to complete and there are several viewing platforms along the route to view the river canyon, which is as deep as 700 meters in some places. At the end of the canyon the Verdon river flows into the artificially created Lac de Sainte-Croix. 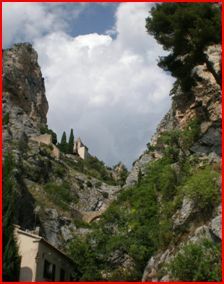 Moustiers Sainte Marie, or simply Moustiers lies at the western entrance to the Gorges. The small, quaint village is a pottery center, and is especially known for its faience pottery. The village clings to the side of a limestone cliff and is seemingly dissected by a spring and waterfall which falls directly out of the center of town. 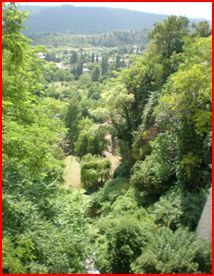 As you wander along the narrow lanes, look above the center of the town where a star hangs suspended between two cliffs. It has an interesting story. According to local lore a knight of the area, who was held prisoner by the Saracens during the Crusades, vowed to hang a star over his village upon returning. Apparently, he arrived home safely. The current star is one of many that have been replaced, when needed, over the centuries.